Taking place at 8:15pm New York time from March 20 to 28, these Easter Special competitions will begin with a pot-limit Omaha re-buy and add-on event offering a guaranteed prize pool of $300. From here, the Easter Special schedule is set to continue on March 21 at Juicy Stakes and Intertops Poker with a no-limit hold‘em turbo re-buy and add-on tournament guaranteeing another $300 while the same amount is up for grabs the very next day via a no-limit hold‘em bounty event. March 23 will see Juicy Stakes and Intertops Poker running a pot-limit Omaha re-buy and add-on turbo tournament featuring a guaranteed prize pool of $500 before a second $300 bounty event on the subsequent Thursday. This programme will then encompass no-limit hold‘em competitions from March 25 to 27 with each offering at least $1,000 while the Easter Special extravaganza is set to close on March 28 with an invite-only no-limit hold‘em freeroll promising a minimum of $500. Limited-time campaign also includes 150 percent reload bonus alongside special incentive for blackjack players. 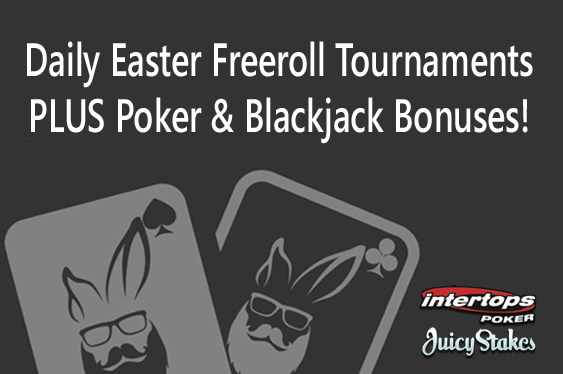 As if this wasn’t enough, Juicy Stakes and Intertops Poker will additionally run daily freerolls with $200 prize pools from March 24 to 28 at 2:15pm while the pair is also offering a special 150 percent reload bonus worth up to $200. This incentive will be available for depositors using the coupon code ‘EASTER2016’ at Juicy Stakes from March 21 to 27 while those parting with cash from March 22 to 28 at Intertops Poker can get in on the act by utilising ‘EASTER16’. “As the busiest poker rooms on the Horizon Poker Network, these two sites are best known for poker but [we] also have a selection of casino games where everyone playing blackjack this Easter will get five percent added to their winnings,” read a statement from Intertops Poker and Juicy Stakes.